The “Recessed LCD” version of our IT Series lectern is a simple, affordable solution. The recessed platform lowers the instructor's LCD, creating a clear view between teacher and student. This table design also offers a large work area combined with many faculty-friendly features. Lectern measures 60"W x 30“D x 36"H with a sit-to-stand ergo-keyboard arm. This adjustable arm satisfies ADA (wheelchair) requirements on most campuses. 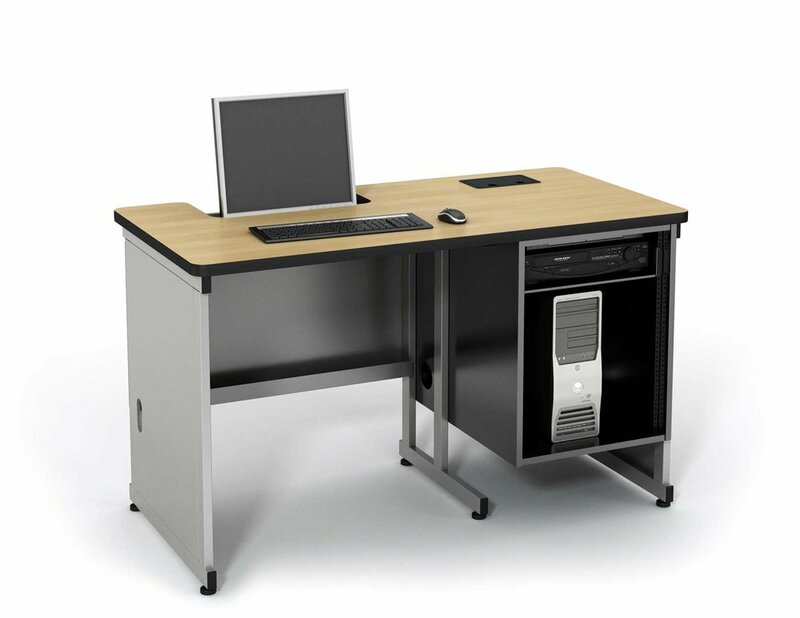 Instructor table to include the following: 60W x 30D x 36H table top (36"H), recessed monitor platform 22"W x 10"D with a 5" drop offset left, two full end panel legs with cable cut-outs, middle BT style leg, standard 24"H rack box on right side, between legs, locking metal rear door with louvers and extended modesty panel to be flush with bottom of rack box.